Chicago Public Schools will take its plea for funding to the governor's front door Thursday as the district faces drastic cuts without help from Springfield. CPS CEO Forrest Claypool and Chief Education Officer Janice Jackson join pastors, parents, students on a bus trip to Springfield for rally for fair education funding. They'll board buses here at Westinghouse College Prep in East Garfield Park, as well as several other locations throughout the city. CPS officials say they will be forced to cut budgets from already cash-strapped schools by up to 30 percent if additional funding doesn't come through. That could lead to much larger class sizes and massive cuts to special education and extracurricular programs. This comes after hundreds of CPS parents marched through the loop Wednesday demanding funding to save their children's schools. The rally began with a so-called “Billion Dollar Bake Sale” at the Thompson Center Wednesday, where they sold items such as “misfortune cookies,” “coming-up shortbread” and “seven-layoff cake” following threats from Cps. 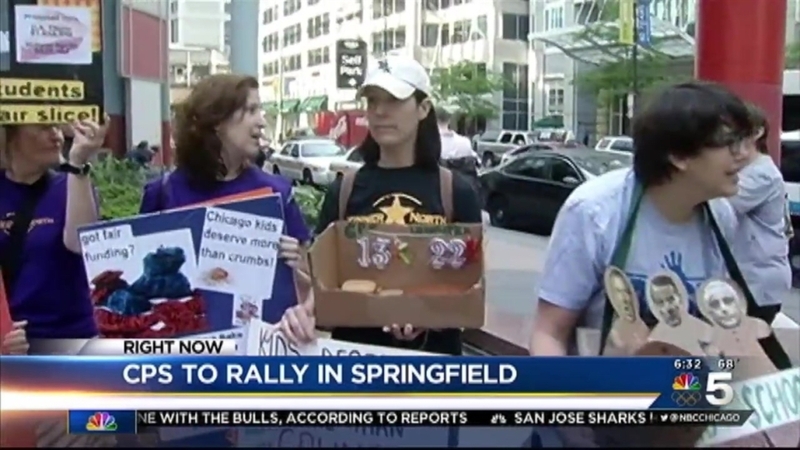 They're calling on lawmakers in Springfield and Gov. Bruce Rauner to increase funding for CPS before Tuesday's budget deadline.